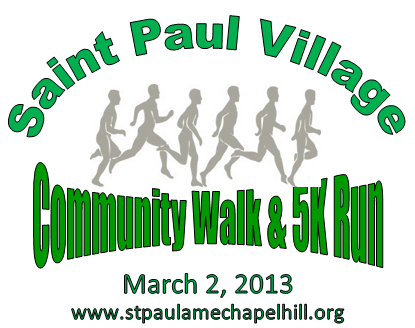 On Sunday, March 24, 2013, the St. Paul Village 5K Walk/Run Committee reported the financial results to the congregation. Checks for 5% of the proceeds were given to the Executive Directors for Inter Faith Council for Social Service and Habitat for Humanity of Orange County. A check for $6,540 was presented to the St. Paul Village Capital Campaign. Many thanks to members of the committee and its co-chairs Anissa McLendon and Joe Bynum for all their hard work. Also, thanks to sponsors and donors! Now let us prepare for a bigger event in 2014!